COMIC BOOKS: Astro Boy: The Movie – Osamu Tezuka’s Legendary Creation Soars Again! Astro Boy is back with a bang in IDW’s adaptation of the forthcoming [October] movie. Distilling the essence of a character that has been a long-running manga; two television series and now “a major motion picture” can’t be easy. After all, there are several decades of Astro Boy material in one form or another. The first issue of the IDW mini-series, adapted by Scott Tipton and Dave Tipton, with art by E.J. Su, begins at the very beginning [a very good place to start] and introduces us to most of the main characters: Dr. Tenma and his son, Toby; Orrin, Tenma’s butler/chauffeur, Professor Elefun, and President Stone among them. When Stone unexpectedly moves forward a demonstration of “The Peacekeeper,” he sets events in motion that will profoundly effect everyone – especially when he insists on using a power source that is, to say the least, volatile. Astro Boy #1 is a fast-paced ride that introduces characters and events in a straightforward and energetic manner. 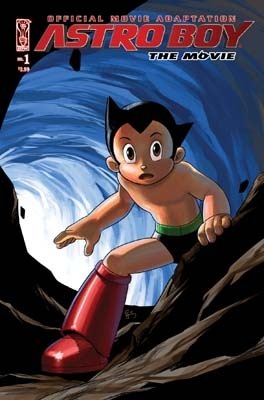 The script allows for the reader to begin to identify with the characters quickly and immediately dread the Peacemaker demonstration – the event that leads to the creation of Astro Boy. The Tipton and Tipton team show a familiarity with the material that draws us into the story with no muss, no fuss. Su’s art maintains a balance between Tezuka’s manga style and a more North American sensibility. His work is clean and beautifully laid out. Even characters like the exceedingly cartoonish Dr. Elefun have more weight and an undercurrent of seriousness that belies their physical beings. Colorist Tom Smith [Scorpion Studios] does a lovely job of reinforcing mood and providing color cues that underscore the story’s drama and humor. His work complements Su’s art extremely well. Neil Uyetake’s lettering and effects work is appropriate throughout [strange as it seems, an overly enthusiastic letterer can undermine an entire book – so “appropriate lettering” is not damning with faint praise.]. Previous PostMOVIES, TELEVISION & COMIC BOOKS: Disney Buys Marvel!Next PostGraphic Novels: Angel: Smile Time – Of Puppets and Vampires!